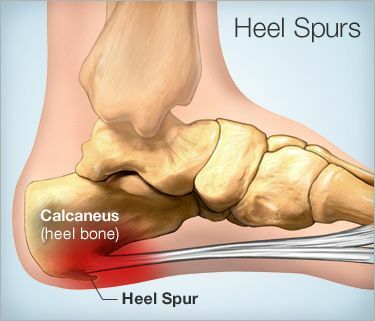 A heel spur is a calcium deposit on the underside of the heel bone. On an X-ray, a heel spur protrusion can extend forward by as much as a half-inch. Without visible X-ray evidence, the condition is sometimes known as "heel spur syndrome." Treatments for heel spurs and associated conditions include exercise, custom-made orthotics, anti-inflammatory medications, and cortisone injections. If conservative treatments fail, surgery may be necessary. Heel spurs often cause no symptoms. But heel spurs can be associated with intermittent or chronic pain -- especially while walking, jogging, or running -- if inflammation develops at the point of the spur formation. In general, the cause of the pain is not the heel spur itself but the soft-tissue injury associated with it. Many people describe the pain of heel spurs and plantar fasciitis as a knife or pin sticking into the bottom of their feet when they first stand up in the morning -- a pain that later turns into a dull ache. They often complain that the sharp pain returns after they stand up after sitting for a prolonged period of time.